Adams Village, a key gateway to Dorchester and a bustling crossroads of daily life, is poised for incremental but substantial improvements over the coming months and years as a new property owner is vowing to pump youthful energy and investment into the aging business district. Civic and business leaders hope the fresh ownership will trigger a positive shift in the village scene, a monstrous collage of neon signs, clashing architecture, and just an overall shabbiness that has settled in there over the last decade. The forlorn nature of the business district stands in sharp contrast to much of the surrounding neighborhood, a heavily residential community that continues to be one of the more desirable and expensive real estate in Dorchester. The problem, in part, has been that some of the most prominent and expansive properties in the village have been controlled by owners unable or unwilling to pump new dollars into needed repairs and cosmetic improvements. Then last month, in what looks to be a sign of things to come, one of the more-distressed buildings in the village changed hands. A real estate trust controlled by the father-and-son team of Peter and John Lydon purchased 775-789A Adams St., a building that is actually a collection of storefront condominiums that include tenants such as Adams Fish, Hair Image, Casali’s Market and Handy-Person caterers. The sale price, which also included one residential condo above the commercial space, exceeded $1.5 million. The Lydons purchased the commercial properties from Arthur Murphy, a Dorchester native who had owned and managed the storefronts since 1986. He remains the owner of the village’s most prominent and, to many, most problematic property – 526 Gallivan Blvd., a two-story warren of offices, nail salons, restaurants, and dingy empty spaces that looms over the intersection of the boulevard and Adams Street. The building, crowned with two large billboards that have themselves become targets of neighborhood activists eager to beautify the district, is valued at more than $2 million, according to city tax records. Last year, Murphy told the Reporter that he was ready to sell his village properties, acknowledging that health problems had made his own management of the sites difficult. John Lydon, a 29-year-old law student who was raised in Savin Hill, read the Reporter article and reached out to Murphy, whom he knew through a Boston College classmate. Lydon and his father Peter, a native of Ireland who started his own Braintree-based plumbing business in the 1980s, also own properties in South Boston. Murphy and Lydon both confirm that they are in ongoing talks about the sale of the Gallivan property, but say that any transaction is not likely to occur until next year. In the meantime, Lydon is acting as a building manager, cleaning out the cluttered second floor office suites in the building and fixing cracked windows. He has set up his own private desk in a corner of the 19,000-square-foot building in what was at one time the office of an auto school. The windows face out onto the Adams Street block that he and his father purchased last month, and Lydon has taken to watching the foot traffic in and out of the businesses. Murphy said that the Lydon family’s roots in Dorchester and their commitment to making Adams Village a long-term focus of their new investment is one reason he decided to sell to them. Another fan of the Lydons is Peggy Folan, who started an online organizing effort two years ago aimed at beautifying the business district. The group, Revitalizing Adams Village Economy (RAVE), has coordinated clean-ups and raised funds for plantings. 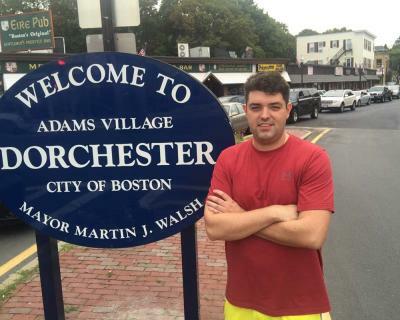 Folan has also lobbied chain stores – including Foodie’s and Wahlburgers – to consider opening up shop in the village. Lydon has met with Folan and other civic leaders to gather their ideas about how to improve the storefronts block that he and his father now own. He and Folan agree that it would make sense to have the storefronts mimic the style and decor of the village’s marquee establishment, the adjacent Eire Pub. The Eire, owned and maintained by second-generation publican John Stenson, is the village’s most renowned business. It sports a white and emerald facade that reminds Folan and others of a tidy village in Ireland. First things first, however. The Lydons and Murphy have not yet finalized terms or a price for the building. “I grew up around here in the early ‘90s and I have a lot of respect for [Murphy] and others for just hanging on. What I’d like to do is find a way for all of these buildings to complement one another in the best way, in a unified way. There’s so much to do here,” said Lydon. In fairness, much has been done already to set the pendulum of progress in motion at the corner. Greenhills Irish Bakery, housed in a former shoe store, is a standout. The crisp and clean business has become a mecca for Irish and Irish-Americans craving soda bread, coffee, and baked goods. Last year, Boston Sports Club moved into another key village building – 540 Gallivan, a onetime supermarket and more recently a drug store that now houses Supreme Liquors and a few small retailers. A year-long renovation of the building was accompanied by a major change outside as well. Supreme Realty Trust, which owns the building that houses the sports club chain, completely rehabilitated the adjacent parking lot, a space that had become badly run-down in recent years. “It’s been a big success,” said the civic association’s Sean Weir of the parking lot’s clean new look and orderly layout. 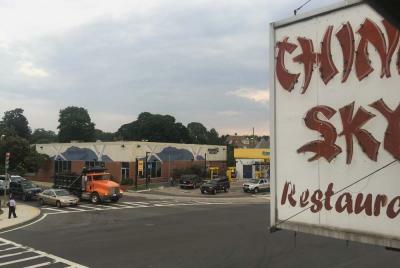 Crossroads of Adams, Granite and Gallivan: The old China Sky sign looms over the intersection. Across the street, an empty video store awaits a new tenant— a restaurant and bar that will be called Sam Maverick's. And last spring, Cedar Grove Civic Association members approved a proposal by two partners to open a new bar and restaurant – Sam Maverick’s – in the long-shuttered Granite Avenue space that was once home to Hollywood Video. The new eatery is expected to open later this year. The two men, who plan to lease the old video store, will go before the city’s Zoning Board of Appeals on Sept. 1 to seek a variance to allow live entertainment and outdoor seating, a first for the village. Another key element to improving the look and feel of the village will be the fate of its landmark eatery, Gerard’s Adams Corner, a throwback restaurant that shares space with a variety store. Longtime owner Gerard Adomunes owns the first floor restaurant and store and controls the rental spaces on the two floors above (including space where the Reporter was headquartered in the 1980s). The oldest commercial building in the village, the property is in need of repair. It is currently valued at $754,500, according to city records, a figure attained by a steady climb after the market bottomed out in 2010. The building would likely fetch far more than that in the current market. Lydon said that he and his father would definitely be interested in buying Gerard’s building in a few years, but he doubts it will be on the market long enough for them to be in contention. In the meantime, Weir and other stakeholders continue to hold out hope that the city of Boston will help bring some order and direction to the village that has proven elusive through strictly private efforts. Adams Village is a strong candidate for a Main Streets district, Weir argues. Such a designation would bring city resources and coordination in the form of a full-time director who would help landowners and tenants make storefront improvements and promote the village as a destination. There are exceptions, say Weir and Folan, who point out that the Blasi family has made its corner of Adams Street and Minot Street – a former hardware store turned bar and restaurant – into an inviting and popular destination. The Eire Pub, they note, is vigilant about sweeping its sidewalk daily and keeping its prominent facade well-painted and tidy. Mary Salas, who has owned and operated Hair Image salon in the building just purchased by the Lydon team, is similarly conflicted. “I would like to see the village change structurally, to be modernized and beautified,” she said. But she’s also worried that a rent increase – as much as $400 a month – might not be tenable for her and other longtime merchants. “I hope to stay in the village, but under those conditions, I have no idea,” she said. “I’ve fixed everything in this place on my own over the last 20 years.” Still, she sounds a hopeful note. John Lydon says he is committed to doing just that. He plans to meet on site with city officials this week to talk about ways that city programs can help with facade improvements. “It should be updated big time and we’re spending a lot of time thinking what could make it look better. Just small things like fixing the lights under the awnings- the things that make an inviting atmosphere in front of a business.